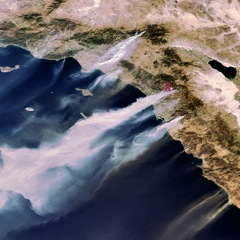 Satellite image of the fires Tuesday, Oct. 30. "X" is us! 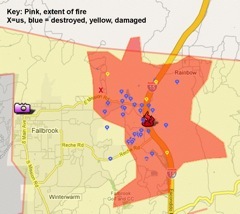 Map showing the extent of the fires, where homes were damaged or destroyed and our location. 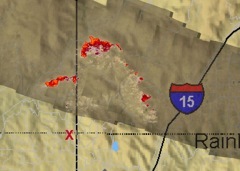 Aerial IR images of the fire on the second day, after burning Red. Mt. 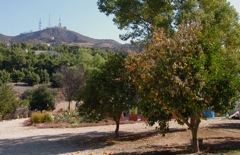 (just to the L of the lake shown) and moving down the valley. 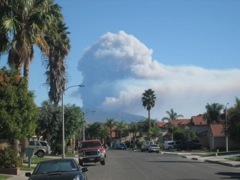 Our accountant emailed us this photo from his home in Temecula looking South. 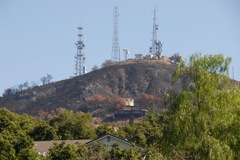 View of Red Mountain from the road across from our driveway. On Red Mt. 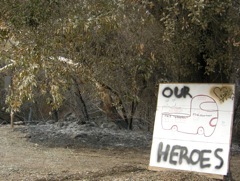 all the brush was burned and the trees killed, but the houses survived. 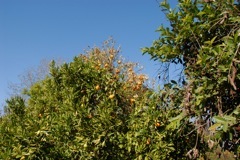 View up the hill from our mailbox. Fire engines were still patroling the area looking for small fires. 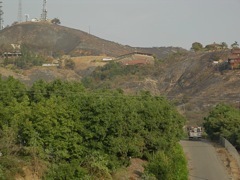 The fire burned teh hills but spared the houses on this side. 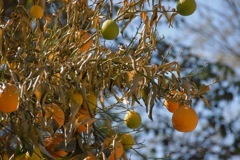 Heat damaged the orange trees on our property well away from the fire, but only on the side facing the fire! The radiated heat and hot wind must have been intense. 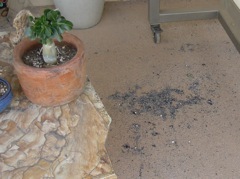 Ash collected under our patio. 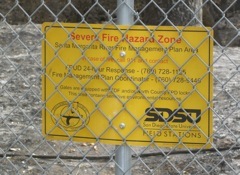 There was some concern by homeowners, not jsutified by the facts. 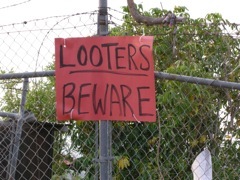 We saw another sign that said " we shoot looters"
The white you see on the ground is ash where the area was severly burned by the fires. This is only a few hundred yards from our house, which was not harmed. 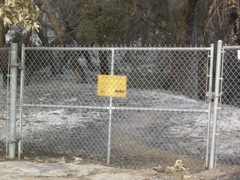 The sign says: "Severe Fiber Hazard Zone"
Fire jumped the street we live on just down the hill. 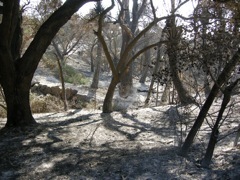 A view of the devastated trailer park. 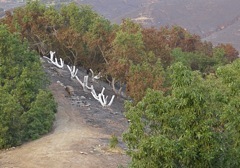 After the fire, the ground is covered by white ash. You can see how hot it gets. 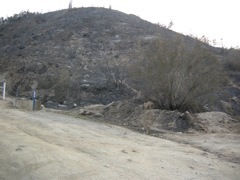 In the upper left is what remains of a house.